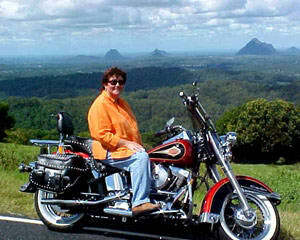 Put on your leather jacket and helmet and prepare for a 60-minute Harley Davidson motorcycle tour around Brisbane. You will go for a sensational ride around the city, seeing the most popular attractions along the way. Get set for a Harley Davidson motorbike blast! On the day of your experience we will pick you up from Brisbane City or Southbank. Imagine the looks on the faces of your family and friends as a rumbling Harley Davidson arrives to take you for 60 minutes of sightseeing around Brisbane! This experience is for one person (maximum group size is two). A great ride through Brisbane and along the range to Mount Cootha. Really enjoyed it all. Brought back the joys from teen age motor bike riding. Wonderful hosts. We had an exhilarating ride on the harleys. Pete, Libby and Rigor were perfect hosts, friendly, welcoming and informative. Peter from Brisbane Harley Rides was an absolute gem.